Other casualties were a tray of cuttings, several young lupins and a couple of osteospermum. There’s no sign of the body. As it’s been raining since October 2011 and is forecast to rain indefinitely, I don’t know when I’m going to be able to tidy this mess up. The shredded feathers of this now-dead bird are ruining the ambiance. Although it is likely to be a cat that caused this mess, it could have easily been a fox as we do see them now and again. 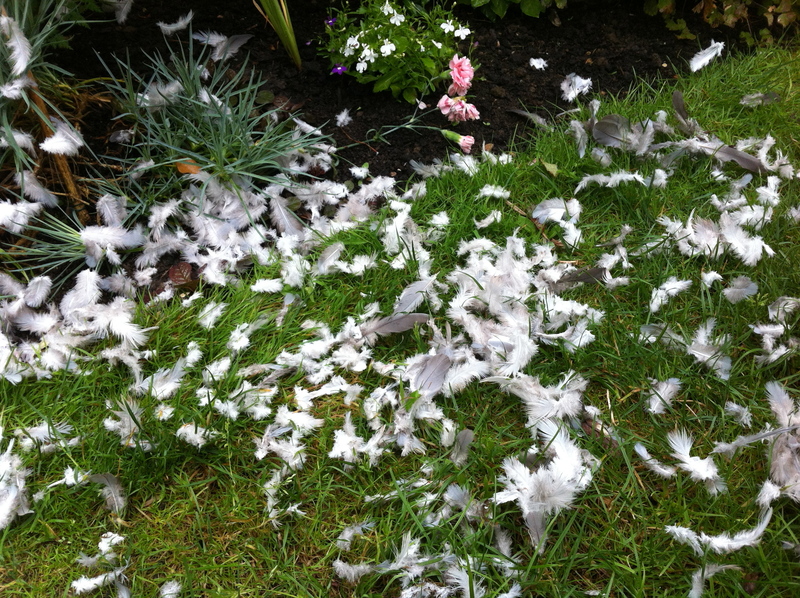 It just may have been a sparrowhawk, they pluck the feathers of the bird they have captured out of its throat before they go in for the kill (“nature raw in tooth and claw!”).